Once we get to 240 hours from an event (that’s 10 days, guys), weather model resolution improves. The US, European and Canadian models all have 6 hour resolution looking out to that time, which gets us to race morning. With a lot of snow on the ground to groom (we have a podcast upcoming on that, stay tuned!) and a cold forecast, we’re not really worried about whether the race will happen, but more of what the course and weather will look like. Cool but not cold. A few nights below zero, most days in the 10s or 20s. The last one is interesting. All of the models are hinting at the same thing, but 10 days out, take it with several grains of salt. What it looks like right now would be temperatures peaking on Friday around 35, potentially some snow or even rain, and then a cold front sweeping through on Friday night. But it could be 40 and rainy, 20 and snowing, or 0 and clear. That’s anyone’s guess. We’ll know more in the next few days. Weather speculation: Last of the snow? Live from the Birkie Start webcam. This is what we like to see! The snow continues to pile up in Hayward. Nearby reporting sites in Spooner and Clam Lake have seen accumulating snow 7 of the 12 days so far this month with 15 to 21 inches of reported not including more snow today; already more snow than fell in the entire month of January (and, it’s possible, more snow in the first two weeks of February than the rest of the winter up until the start of the month). The Birkie Trail has seen a similar surfeit of snow, and should clear two feet in February by the time the storm today comes to a close. This has been a godsend. A week ago, we would have been happy with six inches, since the base, while present, was thin. Twelve would have been terrific. Two feet? That makes the race. And the timing is perfect. With cold weather predicted between now and the race, the snow won’t go anywhere, but it will have plenty of time to be packed, groomed, and set up. The weather between now and race day looks to be cold, but dry. There may be some light snow to freshen up the snowcover, but none of the models is pointing towards the active storm track continuing. Anything is possible, from a blizzard to a rain event, but the most likely scenario for the next 11 days (and, yes, the Birkie is just 11 days away!) is for cold, dry weather to rule. With the snow on the ground and cold in place, I see no real chance the race is anything but a full-course race from the start in Cable to Main Street in Hayward. I’ll never say never, but the chance of a full Birkie today is 99+%. It’s still 18 days until race day, and the Birkie isn’t blanketed with feet upon feet of snow (although a few inches last night helped) but barring any major forecast “busts“, the Birkie should go off as planned. The snow last night helped a lot; the thinner southern half of the trail needed some more cover and every inch helps, especially since this storm was slightly focused towards the south. Another, bigger storm hits tonight, and current predictions range from 4 to 10 inches by Friday morning. Even the low end of this range would be great, putting down a sum of nearly half a foot this week. Ten inches would be a godsend, adding a foot. (I think the lower end is more likely, but we’ll see). More importantly, especially now that we’ve taken care of the snowfall, the longer range forecasts look very good. The next four weeks are all showing below average temperatures for Birkieland, and it’s a wide swath of cold, so we’re not really on the edge of it. The 8 to 14 day forecast is just as good: cold and moist; exactly what we’d want. There is a chance that the weekend before the race a storm will sneak a bit of sleet, freezing rain or even rain up to the race, but if we can get six more inches of snow it might be a benefit, adding to the base (it would not likely be all rain) and adding some moisture to make the trail faster. Some of the most fun Birkies of recent years, in 2009 and 2010, were skied on fast snow with some added moisture, “superhero” conditions with great glide and fast times. Are we out of the woods completely? Of course not. This is weather forecasting, or in this case, speculation. Things can change. But all told, this is a very good place to be. In 2017, I had a “percent chance of cancelation” metric based on current conditions and future forecasts. (This starts around 10%, given that in the past 20 years, two Birkies have been canceled completely.) A week ago, I would have had it at 15%. Today, it’s probably below 5%. Did you try to listen to ye olde Podcast and get errors? Me too. Because I had a lowercase p instead of capital P in my feed. In addition to our recent podcast, I’ve gone through the Guide and made updates to things which have changed from last year (or in some cases, due to editorial oversight, half a decade ago). Keep watching for updates, we’ll post important information (trail closures, etc) on the homepage. Join Ben Popp for a preview of the 2019 race. Find the podcast in your feed, or download it here. Things look good. 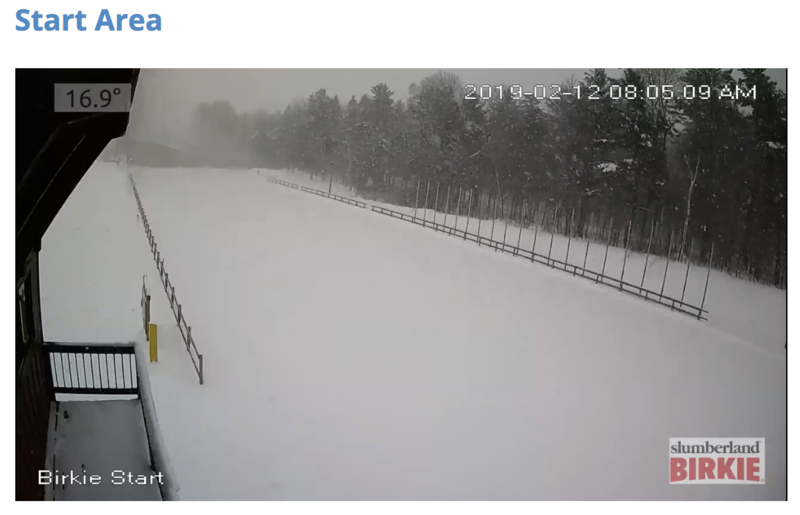 The Birkie Trail survived the meltdown (as much as it was one) and a bit of rain/freezing rain and while it may have some thin spots, reports are that it is in good shape. Looking ahead for the next 10 to 15 days, things look cold. That’s good on it’s own; if it doesn’t go above freezing in the next three weeks, we’ll have a good Birkie. But more importantly, it looks cold with some moisture. A couple of inches Tuesday in to Wednesday, a couple more Thursday in to Friday, and we could be in good shape. We’re not home free until we get a couple of feet of snow down on the trail, but long-range trends look good to stay cold at least through race day. Starting later this week the medium-range models will start pushing out to Race Day and Weather Speculation will get much more involved. Weather Speculation: Can we get through next week? The weeklies still look good. But after near-all-time-record cold (-56 in Minnesota, only -33 in Hayward) temperatures will moderate nearly 100 degrees in the next week. By the end of the weekend, it will be pushing towards 40 in Hayward. 40 is fine. 40 and rain is … less fine. Sunday and Monday are still out, it could be 40 and dry, and then cool down and snow a bit. That would be fine. The snowpack and ground will be so cold that a little warmth probably won’t penetrate the snowpack without significant wind. A tiny bit of 35˚ rain is probably fine. 40 and pouring is not so good. So hope for the best, since if we can get over this hump things look better for a while. If it’s bad, though, at least there’s some time before race day. If nothing else, the cold snap has probably put another few inches of ice on Lake Hayward.